The unit has been updated to include a new top filling port, providing users with a third water intake or filling option There is also a new front clean water exhaust port. From bottom left, clean water exhaust port, used water exhaust port, new water filling port. Lastly, a rear mounted, direct-to-drain port facilitates automatic drainage eliminating the need to manually drain the reservoir. Consistent dry loads every time with the Dri-Tec drying system. With increasing stringency from national guidelines, the BRAVO saves all the data from each cycle. The integrated front USB port allows cycle data to be stored digitally, making record keeping simple and efficient. 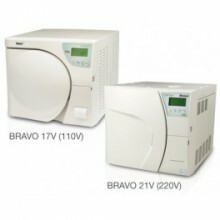 The BRAVO offers numerous sterilization cycles with a wide array of parameters. This allows the user to choose the appropriate cycle for the load, be it solid instruments, delicate hollow instruments (dental handpieces, phaco, etc.) or textiles. Solid material/hollow instruments in double package:1.5kg / 2.0kg. *** When installed into cabinets, a minimum 4”/2” (102mm / 51mm) free cool air space is required on the back/sides, and top of the unit. Click the button below to add the SciCan BRAVO Chamber Autoclave to your wish list.